Lloyd ‘Bud’ Winter, architect of ‘Speed City’ who propelled San José State to the pinnacle of track and field during the mid-1900s, is the 2010 Posthumous recipient of the Pacific Association Legacy Coach Award. Coach Winter created a legacy not only through his ability to coach, but also through his ability to mentor other coaching hopefuls, and promote the sport of track and field. In all, he would coach 102 All Americans, 27 Olympians, and 49 NCAA and 37 world record holders throughout his career as the Spartans’ coach, which took place between 1940 and 1970. Notable Spartans include sprinters Ray Norton and Bob Poynter, ranked Nos. 1 and 2 in the world, respectively, during the late 1950s and 1960; 1968 Olympians Tommie Smith and John Carlos, who placed first and third, respectively, in the 200 meters, and Lee Evans, who took the gold in the 400, and on the 4×400 meter relay team; Ben Tucker, a prominent member of SJSU’s ’62 and ’63 NCAA cross country championship teams; Olympian Willie Steele, who captured the gold in the long jump in ’48 (He competed at SJS before enlisting in World War II. ); and ’68 Olympic Greek pole vaulter Christos Papanikolaou, who became the first to vault 18 feet. Of Winter’s nomination, Poynter noted: Other track and field coaches – such as Stanford University’s Payton Jordan or the University of Oregon’s Bill Bowerman – may have received more recognition and acceptance because their programs had great wealth and media support, but Bud was a creative, competitive, fun-loving teacher, who had great passion for the sport. “I learned how to develop a quality track program on meager resources, how to organize a track team, and build a support group,” said Poynter, who coached Olympians Millard Hampton (’76) and Andre Phillips (’88) while at San José’s Silver Creek High School. “He taught me that it was important to be a good teacher and to share the knowledge with others. He was a fun-loving coach who made the grueling practices fun, and encouraged all racial and ethnic groups to work together. 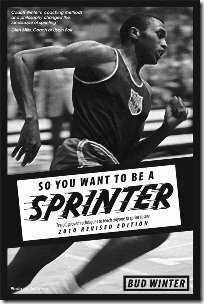 I have been blessed to have mentored hundreds of athletes with his basic principles.” Poynter also coached sprinters at San José City College for six years, and SJS for eight years. He began coaching sprinters at West Valley College upon retirement, and is in his 12th year. Bud Winter had three children with his wife Helen: Michael, Jane and Kathi. Kathi and Bert Bonanno, his assistant during the mid fifties, recall Winter’s effort in having the Minnesota Mining and Manufacturing’s (3M Company) Tartan track placed on SJSC’s campus during the late 1960s. It all started with a “test strip” laid in the early ’60s on the infield. Bonanno, who became an assistant coach for the 1968 Mexican Olympic team with Winter’s assistance, was in Mexico when 3M provided the world with its first artificial turf for Olympic competition. “It had been red cinder at the Olympic Games up until then. 3M hired Jesse Owens to assist them to convince the Mexican Olympic Committee to put that track in,” said Bonanno, whose storied career as coach and athletic director at San José City College includes Olympians who either train or attended SJCC from Hampton to Bruce Jenner, to John Powell and Marion Sidler, to Mac Wilkins and Al Feuerbach. Bonanno also coached the Peruvian Olympic team in 1972; and numerous indoor and outdoor teams in countries including Hungary, Scotland, and New Zealand throughout the 1970s, ’80s and ’90s; and brought the USA Track & Field Championships to San José for the first time in 1984, and then in ’88. Bonanno also started the Bruce Jenner Invitational, which ran for nearly 20 years. This is Part 1 of a multi-part article. Olympian Willie Steele, who captured the gold in the long jump in ’48 did not compete for San Jose State. He competed for San Diego State University (SDSU) and is in the SDSU Hall of Fame. “Choc” Sportsman was Willie’s coach at San Diego State. Here are couple links for sources. Please fix this, because this site is being used as a source Wikipedia and the information is incorrect. I have other documents that support the fact that Willie did not compete for San Jose State that I can pdf and email–such as media guides and the History of San Diego State Track and Field published in 1968. I did a little more research. It looks like Willie Steele competed for San Jose State in 1942 as Freshman where he jumped 25-08.00. After that, he enlisted in the military. His last duty assignment was in San Diego, his hometown, so he stayed in the area and started to attend San Diego State. In 1946 he was coached by Charles Peterson. In the 1947 and 1948 he was coached by “Choc” Sportsman at San Diego State. Willie was the NCAA DI Broad Jump Champion in 1947 and 1948 when he attended San Diego State. It has been more than a year since you wrote your response. I am wondering where you found the bit on Willie Steele competing for San Jose State, as I couldn’t find any results. People who were on its Board of Sparta questioned having him in the Hall of Fame because he had done the bulk of his training at San Diego State. Yet others, obviously, wanted him in because he was an Olympian, and San Jose State wants to claim him as one of their own. I even went to San Diego State hoping to do some research on Steele. I couldn’t find a thing, and was told to contact the track coach. He never responded to my calls or emails. Did you have anything else on him besides what you put online. A friend of mine believes he knows one of his family members. Next time I get to San Diego, I would like to talk to the person.